Musée du Louvre is one of the world's largest museums, and, with over eight million visitors a year, the world's most visited museum. I spent a day at Le Louvre which I have never visited before. This is my first visit to Paris as a tourist, and I had always realized a visit to Le Louvre would be too time-consuming for trips on business or research. One needs perhaps five days to get an overview of Le Louvre. It is a good idea to wear light indoor shoes and no jacket. You get very warm even so, walking all day. As a sociologist I'm amazed at the crowd. We were on time at the Palais Royal - Musée du Louvre subway station, half an hour before the opening, but on our way towards the entrance we realized we were already in a very long queue. In the first queue to get tickets. It would make sense to get tickets in advance online or otherwise. The second queue was outdoors, at Le Pyramide, to get inside. Le Louvre is a legendary place, perhaps a mythical place. 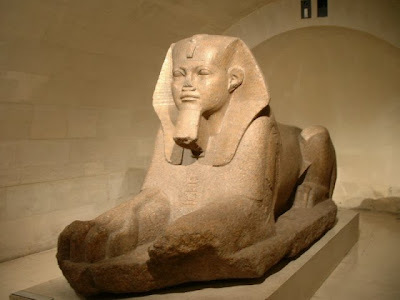 From my childhood I remember the popular tv series Belphégor ou le fantôme du Louvre (1965), located in the Egyptian department of the museum.